﻿ Water treatment system | water filling machine|water bottling machine|bottle filling machine|Suzhou CHENYU Packing Machinery Co., Ltd. The water treatment machine use raw water (tap water, surface water, underground water) pass quartz sand filter,active carbon filter,softening filter,and then sent to reverse osmosis by high pressure pump to produce pure water directly. 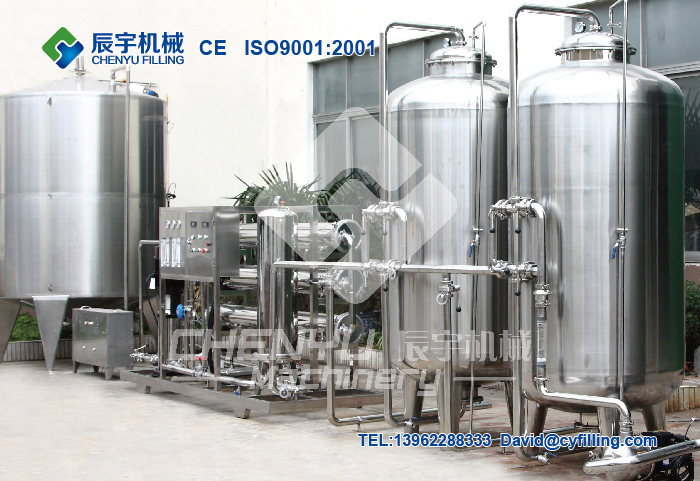 Suitable for produce pure water. Normally the ultra-filtration is used to produce mineral water and spring water,driven by pressure,it is discharging impurity through differnent diameter hole on the ultra-filtration membrane.At present,the hollow-fiber type of polysulfones is widely used in water treatment industry. After the processing of water, to provide pure water filling 3 in 1 monobloc,juice,pulp,4 in 1 filling Monobloc,3 in 1 hot filling machine,carbonated beverage production line,etc.